Kittyland Cat & Kitten Rescue named Kitty Kasas Shelter of the Year! We are thrilled to announce that Kittyland Cat & Kitten Rescue in Desert Hot Springs, CA has been selected as Kitty Kasa’s Shelter of the Year for 2018! This year’s winner was founded in 2014 when zoning changes in Riverside County suddenly forced the closure of an existing animal shelter on what is now the Kittyland property. The dogs at the old shelter were safely relocated, but the cats had nowhere to go, and were in immediate peril. Ann Woods, an English transplant to the American desert and a volunteer at the old shelter, leapt into action. After working with Riverside Animal Services to ensure safe temporary housing for the cats, Ann successfully negotiated for ownership of the property, and Kittyland was born. Little did Ann realize, however, that a bigger challenge lay ahead; due to the zoning changes, the entire property and all facilities would have to be brought up to code. The project would be massive and expensive; the old shelter had been in operation since the mid-eighties, and almost nothing had been updated in all that time. Just a short time after opening it’s doors, Kittyland was facing a closure crisis of its own. But Ann and her growing band of volunteers would not be deterred. They went to work, raising funds and working directly with local government. Happily, the Riverside Planning Department recognized the importance of Kittyland as the only feline rescue in the area and allowed the shelter to remain open while the team worked to bring the facility into compliance. Today, Kittyland Cat & Kitten Rescue is a thriving example of the type of shelter we at Kitty Kasas work hard to support. A place “where kittens and cats are nurtured with compassion in a safe environment, and where senior, disabled and unwanted cats are valued and can live out their lives in dignity and peace.” That is why, in March of this year, we selected Kittyland as our Shelter of the Month, and provided a “room re-do” for the shelter’s open play area. And it’s the reason we ultimately selected them from among many worthy candidates as our Kitty Kasa Shelter of the Year. The Kittyland story is inspiring, but it is far from over! Work continues in the effort to bring the facility into compliance with local regulations, even as the team celebrates the adoption of it’s 1000th kitten. As is ever the case, donations of time, money, and supplies are sorely needed and always welcome. If you’re in the Coachella Valley/Desert Empire area, you have an upcoming opportunity to stop by Kittyland, enjoy some food and festivities, and contribute to the cause! On Sunday, December 2nd, Kittyland is throwing a bash to celebrate their redesigned play area, as well as the opening of a new nursery and several “surprises” in the cattery. The party will include a gourmet hot dog bar, Ann’s Famous Chili, and an appearance by Ozzy Osbourne bassist and dyed-in-the-fur cat lover Rob “Blasko” Nicholson. If you’re in the region, stop by, enjoy some great food and festivities, and make a donation. RESERVATIONS ARE REQUIRED, so please contact Kittyland at 760-251-2700 to secure your spot. 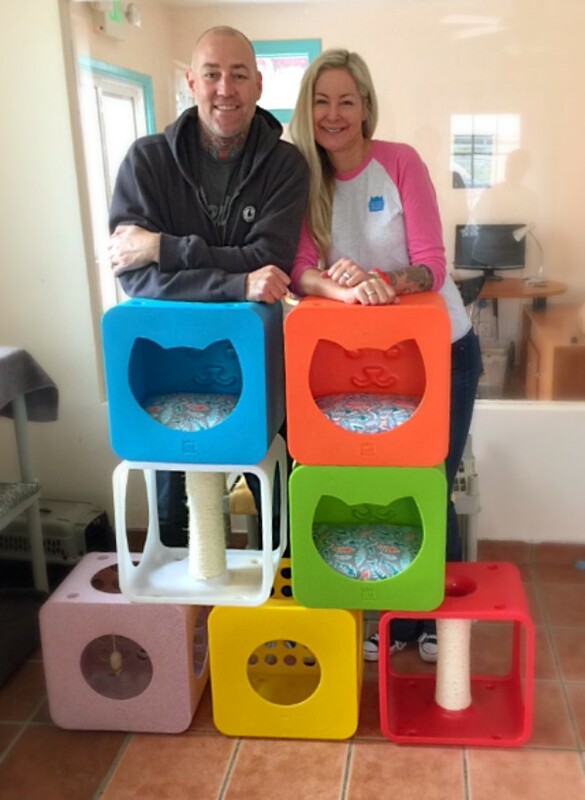 Congratulations to Kittyland Cat & Kitten Rescue! Our 2018 Kitty Kasa Shelter of the Year!